Global Food Initiative has switched on this ID in a big way. In combination with The Future Perfect and The Many Psi Games of Caprice Nisei and Marcus Batty, getting the win becomes a grind for the runner. Those two agendas won't cycle out either. Add Econ and ICE to taste. The ability on this ID may not seem that good at first. After all it helps the runner as much as the corp right? Technically yes, but the thing is, you chose the ID, you can build the deck around it. You can make the ID work for you while minimizing the benefit it does the runner. That said, it seems there are two good ways to build your deck. As others have noted, a popular strategy is to include all three-pointers. This would include three Global Foods Initiative and probably three The Future Perfect. That way the runner, hopefully, will need to steal three agendas to win, while you only need two. Shi.Kyu can make this more likely. Combine with psi games to get the agendas scored. I've always played this ID differently though, with nine two-pointers. Shi.Kyu can have the same effect, making the runner need one more agenda than you to win. I've been playing on Jinteki.net with the following for a little while now and winning most games: Trick of Light, Mushin No Shin, and Plan B. Agendas are three Braintrust, one Philotic Entanglement, one Merger, three Medical Breakthrough, and one Nisei MK II. I actually forgot about Shi.Kyu and have been playing without it, but I just added one and will see if it helps. If you Mushin a Plan B, four out of five times, the runner will check it. They fear it is a three pointer and feel the pressure because of this ID. If they don't, Trick of Light will let you score from hand next turn. It is easy to get one of the five, sometimes six 3/2s in hand, the issue sometimes is getting Mushin and Plan B in hand. A couple advance-able ICE are platforms for tokens too if you don't get the cards you need. The deck, being small, is vulnerable to Noise, but then, Noise is a friggin pain no matter which deck you are using. Expose is bad too. But it is a fun deck. I'd like to mention an amusing scenario that almost happened last night. I had scored four points early with a Trick of Light and a Plan B. The runner then played Employee Strike. He realized right after that it was a mistake and wouldn't help, hurt actually, but kept it on the table. I ended up winning before it could happen but I was thinking... What if he had scored six points while Employee Strike was active. If I then scored my last agenda, we would both have six points and Employee Strike would be trashed. Who would win? Me, because it was my turn? I'd be happy to call it a tie if that ever happened! When Harmony Medtech: Biomedical Pioneer was published with the Android - Netrunner Deluxe Set Honor and Profit, the first reviews saw this card as a Fast-Advance-ID. Unfortunately it didn't take off. Maybe Fast-Advance was just the wrong philosophy for this ID. 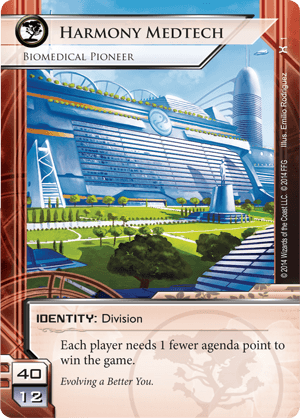 What it is: 6 Agenda Points for winning and a minimum of 40 cards per deck means I can lower my agenda density by including only 3-Pointers. The Biomedical Engineer let's the runner dig through R&D. 6 Agendas in a 44 card Deck means, that the runner only has a 13,64 % chance to find an agenda. What it is not: Harmony Medtech: Biomedical Pioneer is not about damage dealing or fast-advancing. Its not even about keeping the runner out of your servers. Instead it walks the same fine line as Nisei Division with all its Psi games is. A first round Mushin No Shin plus Executive Retreat or Utopia Fragment with a Chimera in or maybe just a Paper Wall in front of it, can mean a pressure point for the runner as you are on match point. Mix in some Shi.Kyū and the runner has to find 3 of 6 agendas. If half of those agendas are The Future Perfect its even more interesting. All in all, Harmony Medtech: Biomedical Pioneer is perfect for tournaments. It's incredibly fast (No game lasts longer than 15 mins) and every game is like walking the razor's edge. This ID is not good against Notoriety. If you think your opponent is using Notoriety, I strongly recommend defending your central servers. If they cannot get into your central servers, they will have a tough time playing their Notoriety, and you will have an easier game.